Luxury 3b/3b Outstanding skyview of Chicago from your every room. Massive 1600 sq ft modern condo features wood floors, granite, leather and Egyptian cotton finishes. Luxury bedding and plenty of fresh towels and a fully stocked gourmet kitchen. 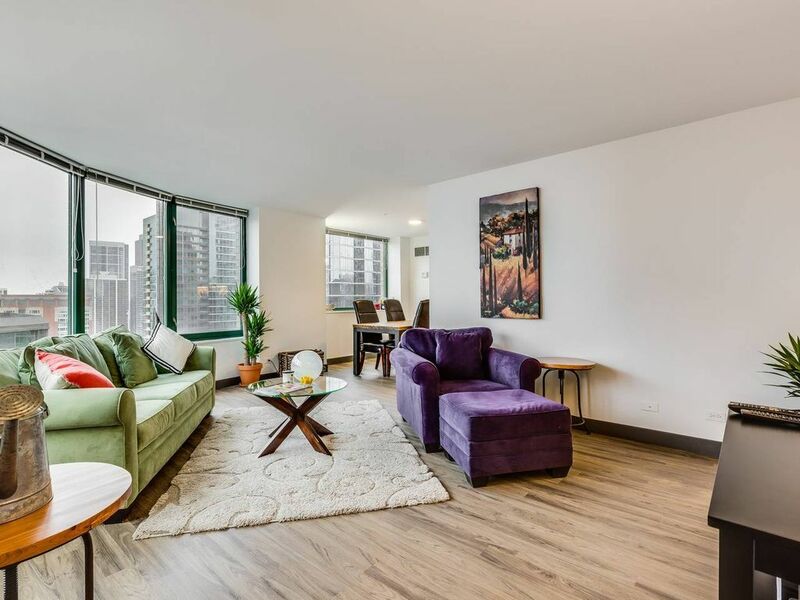 Indoor/Outdoor pool open year round, outdoor lounge, cabanas, grills, and fire pit, and it's located in the heart of Streeterville just steps from Magnificent Mile shopping, Navy Pier and Triangle dining. This 3 bedroom/3 bath is the perfect location for exploring Chicago and sets the standard for Chicago luxury. The beds have fresh, clean and crisp linens and the bathrooms are stocked with fresh towels, shampoo, conditioner, and body wash. We will also include 1 hair dryer. The kitchen is full of our cooking utensils and feel free to help yourself to anything in the cabinets and fridge. An iron/ironing board are also in unit for your convenience. Guests will have private access to the unit. Everything you need is right outside your doorstep! Downtown Chicago is a city with an appetite—for food, of course, but also for design, history, and culture. Come here to marvel at the cutting-edge architecture or take in the gorgeous views of Lake Michigan; to spend a day cheering with baseball fans and a night laughing at a comedy show; to shop, to visit renowned institutions like the Field Museum, The Art Institute and the Adler Planetarium, and to experience the legendary blues scene. To do all this, you'll need nourishment: taste deep-dish pizza, piled-high hot dogs, Italian beef sandwiches, and more. You are minutes away from bus and train stops. There is no parking available in the building, however there are several garages and lots within a block of the building. We recommend the apps SpotHero or ParkWhiz to find and book parking. We are pleased to offer FREE and Unlimited use of the Luxe valet parking service during your stay. This app allows you to valet park your car anywhere in downtown Chicago. To use this service, you must be able to download the Luxe app to your device and set up an account. You will be provided 1 set of keys to access the property. Everything from check-in to check out was great! The view from this apartment was phenomenal! We had a large group of women and there was plenty of space for all of us without tripping over each other. Very centrally located, close to Navy Pier, shopping and site-seeing. We are already making plans to come back here again!! Super great guests to host and a pleasure to have in overall. Would gladly host them again. Perfect location, beautiful view, and property manager was very helpful. Thank you Juan for everything. Great location for family getaway. We enjoyed our stay at this condo with its great view, location, comfortable beds, and room for all of us to spend time together. Smooth check-in process with good communication. Christine were a great guest, very tidy and clean. I strongly recommend them to other hosts! Great spot, got pretty warm during the day but better than the alternative. Well worth the difference in hotel accommodations with a view to boot. Thank you for staying with us, Steven! I am glad that you liked the apartment and it's location. I would be happy to host you again on your next visit to Chicago! This is a lovely condo on the top floor of the building. Communication with host and on-site manager was no problem. We enjoyed our stay, would recommend. Great views of Navy Pier. Close to Michigan Ave. We enjoyed the nearby restaurants. Checking in and out was easy. The on-site manager was responsive and helpful. The pool was large and warm. Residents have to go through the pool area to take their dogs out to the condo's dog area. That was fun for the kids to check out all the pups. We didn't cook but did use the coffee pot and washer and dryer. All worked great. Having 3 bedrooms/ 3 baths was perfect. It was pretty cold so we didn't walk around as much or as far as we would have. Catching a cab was easy. $12 to Union Station. $20 to museum of science and industry. Maybe $15 to Shedd. Thanks so much for staying with us, Leann, and for writing such a nice review. I'm so glad you were delighted by our great location, amazing views and top notch service from the concierge. We look forward to having you back soon! The place is perfect for a girls getaway. Loved the view and location. I'm so glad you had a great time, Denise! I look forward to hosting your next girls weekend!